Popular online finance service Mint launched a new feature on Thursday that uses Twitter's real-time information stream to keep you up-to-date on the latest financial news and tips. Called Money Tweets, Mint's newest addition is a great example of how businesses and services can exploit Twitter as a source for topical links to important news stories and helpful information. 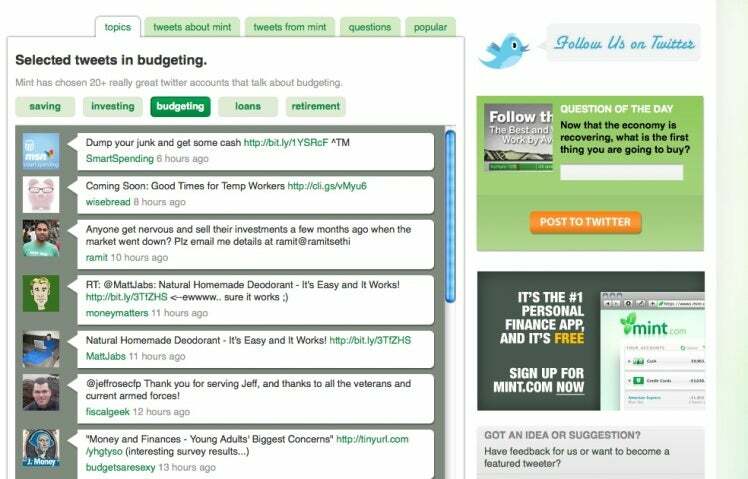 Money Tweets breaks down the information into five categories: personal finance topics, tweets about Mint, tweets from Mint, Mint's Question of the Day, and popular discussions. But this feature still has some bugs to work out. In my tests, the popular section had trouble switching between topical tweets. Clicking on the Goldman Sachs topic gave me appropriate posts related to that subject, but when I tried switching away to another topic the list of tweets didn't change. You will also end up with the occasional misplaced tweet. When I was looking at tweets related to the government bailout, a post related to Motorola's new Droid smartphone popped up. If you're wondering about what the latest tweets from Mint are, or who's talking about Mint on Twitter, Money Tweets has a section for that as well. You can also get interactive, by answering Mint's Question of the Day. 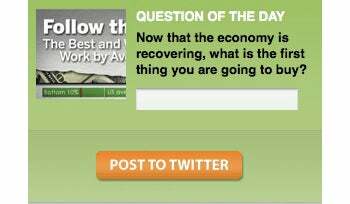 These are usually topical questions that you may find interesting, such as "Now that the economy is recovering, what is the first thing you are going to buy?" To play along, you can either answer the daily question right from Mint (you will be redirected to Twitter.com to approve the post) or answer using your favorite Twitter client by adding the '#mintqotd' hashtag at the end of your message. 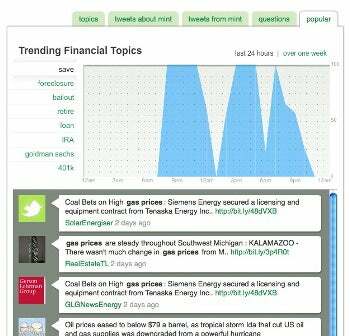 Money Tweets is an interesting way to keep an eye on the financial world by pulling in real-time information. But I'd like to see Mint make this feature even better by turning their Topics categories into Twitter lists. That way you'd have the option to pull Mint's recommended Twitter sources into your own Twitter feed. It would also be nice if Mint would add a feature that let you retweet particularly interesting posts you find on Money Tweets. Those are small complaints though. For the most part, Money Tweets is a great way to keep on top of financial information and money-related discussions happening online. Check it out at mint.com/twitter.